A food bank is homeless after the community centre it uses was wrecked by vandals in a "mindless attack". The Malling Community Centre in Lewes, East Sussex, said thousands of pounds worth of property was damaged after the break-in at about 23:30 BST on Friday. 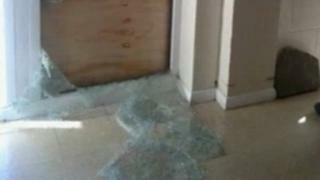 Almost every window was smashed, fire extinguishers were let off and cupboards were ransacked. The centre, which is used by dozens of community groups, is closed until further notice. Liz Allsobrook, chairman of Malling Community Association, which runs the centre, said: "I am shocked, angry and upset. "This is a mindless attack on a community facility." Nothing was stolen, she added. A spokesman for Malling Food Bank said Monday was its busiest day and that it would continue to feed those in need, operating from the centre's car park if necessary.